Every day thousands of building occupants visiting schools, hospitals, hotels or at their place of employment, rely on our emergency evacuation diagrams for egress and fire safety instructions. Since 1999 Pictographix has specialized in the design and fabrication of custom building evacuation maps and safety signs. We provide code compliant EvacMap signs to every state and province in North America and to clients around the globe. Our team of graphic designers and sign experts produce custom safety signs to meet client requirements for aesthetics and functionality. The posting of building evacuation plans, fire evacuation maps and emergency exit signs are necessary to meet fire and building code requirements. Employers must comply with OSHA requirements and institutes must adapt to accreditation programs (JCAHO, AAAHC). In many cases posted building evacuation maps are required to indicate emergency evacuation routes and building evacuation procedures. Posted fire and evacuation instructions should work in conjunction with the facility Emergency Action Plan/Fire Plan. 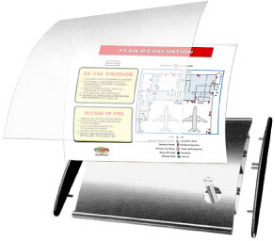 A wide selection of durable and economically priced sign holders and custom-printed plaques, including 'High-Glow' photoluminescent (glow-in-the-dark) sign holders are offered to properly protect and display your evacuation maps and safety plans. Handsome sign displays convey a professional look and your building occupants will feel confident that their safety is in good hands. Properly designed diagrams and functional displays will impress not only your OSHA and fire inspector but also your clients, employees and building occupants. 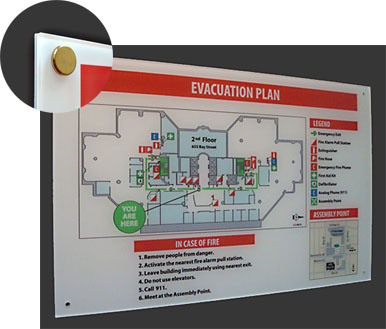 Have your building evacuation plans printed to Metal, Acrylic, PVC placards or choose from a selection of evacuation plan sign holders. 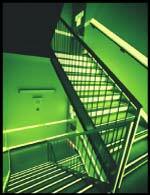 Building evacuation plans, photoluminescent exit signs and path markers provide an advanced "visible safety solution". 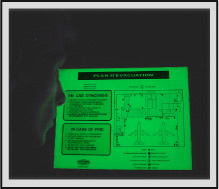 Our line of photoluminescent exit signs and evacuation maps are found in schools, hospitals, oil platforms, high-rise office towers and in government buildings world-wide. EvacMap™ fire evacuation maps display written and graphic safety instructions that are tailored to your facility and fire ordinance requirements. Floor plans in 2D or 3D perspective are prominently featured and viewer location, emergency egress routes, fire exits and safety equipment are standard. Site maps, EMS access routes, assembly areas and custom features can be added as needed. Pictographix supplies UL924 listed photoluminescent exit signs and UL1994 listed photoluminescent path markers. UL listed photoluminescent products meet all building codes and are tested and certified to meet the stringent guidelines set forth by the ICC. Many jurisdictions have adopted the 2009 International Building Code/Fire Code which outlines the requirements for photoluminescent exit path markings in high-rise buildings (75 feet). Browse through our wide selection of all-aluminum UL listed photoluminescent safety signs, pathway markers and stair nosing. Turnkey UL 1994 installation solutions are provide for many jurisdictions including NYC clients (MEA). Distributor inquiries are welcome. (Photoluminescent products for New York City LL26 (Local Law 26). To assist your building occupants with building evacuation in darkness, Pictographix photoluminescent building evacuation plans, exit signs and path marking systems provide clear direction to your exits. A wide range of UL 1994 listed photoluminescent path marking systems are provided. Photoluminescent exit signs and path marking products are UL and MEA (New York) certified and surpass all international standards. EvacMap™ Building Evacuation Plans indicate the location of fire and safety equipment, egress routes and workplace evacuation procedures. Non-electric safety signs and path markers indicate the direction to safety under normal or blackout conditions. 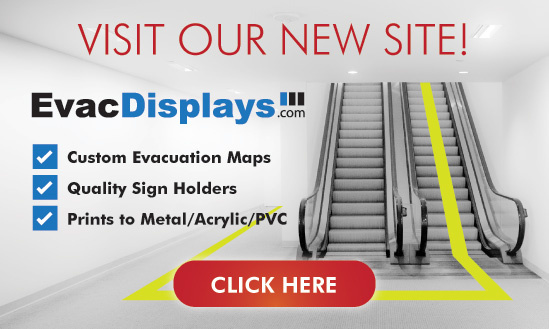 Custom building evacuation maps and UL1994 listed photoluminescent signs and stair markers meet all national building code requirements including New York City (LL 26). Building evacuation maps are a component of the Emergency Action Plan. EvacMap™ fire evacuation plans and fire safety maps are designed to compliment site specific Fire and Emergency Action Plans (EAP) and to meet local / national fire safety requirements. Precision drafted emergency evacuation maps are delivered to your door, ready to install. Offering a choice of 2D or 3D floor plan layouts, color preferences and a wide selection of casements and emergency evacuation sign holders. Projects are priced to meet your budget and aesthetic requirements. Login to access and verify your diagrams online. Print copies as needed. Save time and money by ordering through a specialized service bureau. Free consultation and Toll-Free help line. "Illuminate your Evacuation route During Power Failures"
Photoluminescent signs and path markers illuminate (glow-in-the-dark) immediately following a power failure enabling building occupants to evacuate safely down staircases and through passageways. All photoluminescent products are manufactured using a non-toxic, non-radioactive phosphor-based compound that absorbs energy from ambient light sources. During a power failure this stored energy is slowly released, illuminating safety signs and path markers allowing for safe evacuation in darkness. Pictographix high performance photoluminescent products are manufactured using Strontium Aluminate Oxide pigments that provide a ten fold increase in glow intensity over traditional luminous products. High performance photoluminescent products have been accepted by standards and regulatory agencies (IBC, NFPA, IMO, APTA) and are mandated for use in numerous jurisdictions. Pictographix photoluminescent products are Listed UL 1994 for compliance with ICC 2009-2012. All-aluminum stair treads and nosing with anti-slip. Pictographix luminous safety signs including UL listed building evacuation plans, stair nosing and path markers. Signs and markers are available on all-aluminum or PVC substrates. Call for turn-key New York City Local Law 26 solutions (MEA and UL 1994 approved products with installation). Our service model caters to clients in property management, transportation, government and industry. With new products continuously being developed, PictoGraphix offers a large selection of stock photoluminescent signs, path markers and products can be customized to meet any requirement.